This is a little note for those who have had dreams of singing but don’t think it’s a reality for them. Perhaps you’ve been told by someone close to you that you can’t sing. Maybe you’ve even told yourself that you can’t sing so why even bother? This is a gentle reminder, that you should bother. A note to say that anyone can learn to sing and should sing. Did you know that singing is one of the best forms of stress release? It’s healing for the mind, body and soul. Singing in a group releases so many happy chemicals into the blood stream. You leave from it feeling happier and closer to the people you were singing with. Why deprive yourself from something so bloody good for you? Check out these happy people and tell me that I’m wrong? 1. Put on your favourite song right now and sing at the top of your lungs! 3. If you want to learn how to build your voice and use it, check out my Frequently Asked Questions page and if it resonates with you, book in. Or Google ‘Singing Teachers in my Area’. I am a part of a huge network of amazingly talented singing teachers; I can recommend a coach to you. Email me. You may be saying, yeah, yeah, yeah what if I’m tone deaf? My answer to that is, you’re most probably not… Read my previous article about tone deafness here. Anyway love, I hope this brings some joy and little bit of hope to you. If it resonated with you, could you please share the love by sending this note to someone you know who may benefit from it? Also let me know in the comments what song you will be blasting right now to sing at the top of your lungs to! P.S. I am working on some exercises for the very, very, beginner students that will be available in the student portal. You get access to the student portal when you book in for your first lesson. Thinking of becoming an Airbnb host? Here's how to be a Superhost. Don’t have time to read this article? Listen below. Now, you’re probably wondering why as a singer and a teacher that I would be writing a blog post about being an Airbnb host. The reason why I am sharing this information is because becoming an Airbnb host has completely changed my life. Not only has it connected me to some of the most incredible people from all around the world, financially, it has allowed me to build my performing & singing teaching business without the stress of having to afford my rent each week. So, if you think that expanding your network of friends while making some extra coin to support your dream business or save for a home deposit or an around the world trip sounds amazing, keep reading. Unless you have been living under a rock (no judgement and only kudos to you if you do), you would have heard about Airbnb – the share economy’s solution to affordable accommodation that not only allows world travellers to live with the locals of their destinations but also gives those with a spare room the opportunity to make extra cash. Despite the rare horror story that you may hear about Airbnb, no one can deny its popularity and its staying power in this new economy. After all, it makes that overseas trip or the quick visit interstate so much cheaper, can turn strangers into life-long friends (some of my besties were initially my guests), and can transform your baby boomer parents with rooms to spare into hip entrepreneurs. Perhaps you’re reading this because you too have thought about opening up your humble abode to the world but don’t know how to get started. Perhaps you’re worried about your safety or people touching your stuff. These are real concerns, which I totally get. Before I embarked on my Airbnb hosting journey, I had them too. I’m here to put your mind at ease with an honest account of my experience as an Airbnb host. Actually, I don’t mean to brag, but I’m more than just a host, I’m a Superhost. It’s a title one earns, but if you genuinely like people and put a bit of effort into your home’s appearance, it’s not too difficult to become one. AND if you thought just having the title sounds impressive, Airbnb rewards you with extra (quite generous) perks. Here’s how you can become a Superhost too! Now some would say their rent doubling is pretty unfortunate, but for me it was a blessing. 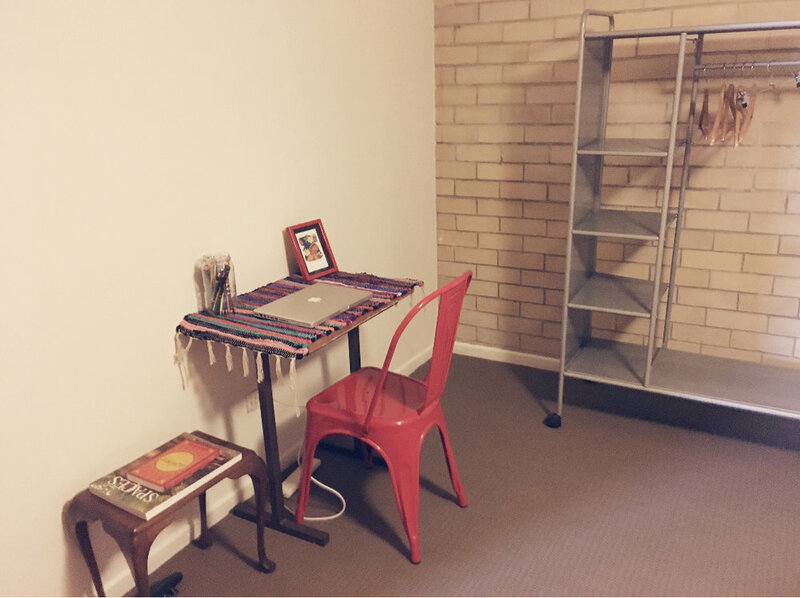 I was on the fence about Airbnb but having to pay that extra $200 a week rent and not wanting to go back to housemate living was enough to jump straight in and never look back. It was the perfect option for me as a home and people loving Cancerian because while I wanted to be in complete ownership of my space, I also loved the idea of visitors. On a side note, I think my love of entertaining people comes from my Greek background. My family were café owners, fruiterers, fish and chip shop owners and now just general feeders. We LOVE people and we want to take care of them. At the same time, however, I go through short periods where I LOVE to be alone. This is how I recharge my batteries, and this is why Airbnb is especially a good fit for me and for other introvert/extroverts. Why? Because you can choose when you want guests and when you need a break. Moreover, as a host, you can decide whether you want short-term or long-term guests and only accept people who you feel comfortable with based on their reviews left by previous hosts. On that last note, you can set it up so that people can automatically book in or they need to send you a request for your approval. I personally prefer people to send a request through. That way you can check out their profile and reviews as well as establish whether they will be a good fit for you. For example, if you have a rock musician requesting to stay and she/he will need to practice in your space with their band (a highly unlikely scenario but indulge me) and you are one who loves your peace and quiet, you can politely decline. I can’t stress enough how important it is to tailor Airbnb hosting around your personal values and boundaries. Otherwise, you run the risk of feeling burnt out and/or resentful. Remember, a Superhost is a happy host. When you take care of your own needs first, your guests are only going to get the best version of you and you will also enjoy the experience. Now, I unashamedly love the shizzle out of my place. First up, it’s quite big. My guest room is HUGE. I also have a large veranda and two big living areas, with one of these being my singing teaching studio and office. It’s also SUPER cute and beautifully furnished. I’m sorry (not sorry) but I’m not humble when it comes to my taste in interior styling, even if it is mostly cheap and cheerful. Also, my apartment is ridiculously close to the city and in my opinion, I live in the coolest suburb of Brisbane. BUT… my place is super quirky, which is a nice way of saying, it’s old. The lino floor hasn’t been replaced in 40 years, it can get pretty dusty in here despite regular cleaning, and in our Queensland summer, this place turns into a 1970’s sauna. But does this stop people from coming? Do I get negative reviews? No! One of my recent reviews. I think people genuinely appreciate honesty and authenticity. I’m very upfront about my apartment’s quirks in my profile and in my communication. Also, all of the photos on my listing are 100% accurate. I honestly believe the Universe rewards you for your honesty and will always bring you fabulous guests, providing that you tell it as it is, offer a reasonable rate and you are kind and hospitable. By the way, I learnt this the hard way by receiving a handful of negative reviews when I first started, regarding how hot my apartment is during summer. So instead of taking personal responsibility for global warming or adding to our climate and my electricity bill’s demise by installing and running an air conditioner, I now I just tell it as it is, right on the top of my profile. I leave it up to the Universe and I have faith that I will always have people booking in despite the cons, and you know what, they always do. I’m really lucky to have a reasonable landlord. Initially I feared telling him about Airbnb but then realized it would be in both of our best interests if I was up front and asked for his approval. Many people do host in rentals without permission, but they do run the risk of their neighbours and landlord finding out with potential negative consequences. Also, if that was me, I would be super anxious, which isn’t a nice way to live. When you do seek approval from your landlord, go into this conversation armed with as much knowledge as possible so you can counter any of their concerns. Things they may worry about would be property damage or liability, the fact that you may be making a profit from their space or that you are subletting without their knowledge. In my situation, I have the adequate insurance and I am earning enough through Airbnb to cover a bit over a half of my rent. Now the other group that you need to be upfront with is the ATO. You MUST declare your earnings through Airbnb as income! This isn’t terrible, however, especially when you adopt a business mindset. Just keep decent records and you’ll be more than alright! Remember, a Superhost has a clear conscience. They don’t ever need to freak out every time they hear a knock on the door or see a missed call from their landlord or get a letter from Canberra. If you are on the fence about Airbnb, it might be that you feel uncomfortable about opening your home up to strangers. I get this because I come from a safety-first kind of family. I also know what it’s like to have these said safety fanatical family members (who absolutely mean well) telling you stories such as the “woman in Melbourne who was stabbed to death by her Airbnb guest.” By the way, I tried Googling this and couldn’t find anything about it. I could only find a story about a host killing his guest. Grim. Anyhow, the reality is that hosting people from all around the world is mind and heart opening. You will learn all sorts of cool things about culture, human behaviour, people’s stories and yourself. If it puts you at ease, you can always install a lock on your bedroom door. You can buy one from Bunnings and get a handy gal/guy from Airtasker to install it for you. You can also have a rule that you only take guests who have reviews left by previous hosts. By the way, about handful of my best friends were initially my Airbnb guests. Honestly, it has been the most rewarding experience of my life. In saying all of the above, if you do get a guest who makes you feel uncomfortable, you are 100% in your rights to terminate their stay early and get Airbnb involved. Perhaps even give Airbnb a ring first and explain the situation. I only had one guest out of the hundreds who stayed here make me feel extremely uncomfortable. Luckily, I had a good friend couch surfing here at the time. The guest only became super creepy the night before his departure and luckily my friend was here to help me put this guest in his place. This is when I learnt the invaluable lesson to only accept guests with reviews or those who I get a good feeling about over a series of messages. You really don’t have to do or spend much to make your place look nice. With Kmart and IKEA, you can have the latest looks without burning a hole in your pocket. 1. A modern quilt cover set with eye catching cushions. I also have artwork on the walls and a couple of bed side tables with a lamp and aspirational trinkets and books, including Frankie magazines. On the desk, I have a magnetic board (from Typo) with a list of the ‘house rules’, the Internet password as well as my contact details. A lovely idea to help your guests navigate your city, is to make a little travel guide. Now this can be as simple as putting a few dot points into a word document and printing it out, making a book on Canva – an easy to use online design software, or adding a page to your website and sending your guest the link. Perhaps you may even want to make a video on your smart phone and upload it to YouTube. The choice is yours. I’m not going to lie; I am no clean freak by nature. However, being an Airbnb host has forced me into some great habits. After all, if you are charging a cleaning fee, you are essentially being paid to tidy your own home. I won’t go into details here because the idea of talking about cleaning bores me to tears. Just keep all surfaces spick and span, vacuum and mop the floors regularly, wash up after yourself, don’t leave crap lying around, make sure all communal spaces are orderly and ensure your guest room is immaculate. This goes without saying but ALWAYS have clean bed linen and towels for your guests. If you don’t think you can do this, then outsource. Pay somebody else your cleaning fee. As a host, a big part of your ratings comes through keeping a prompt, clear and open line of communication. Don’t leave it too long to respond to your guest enquiries and as mentioned previously, make sure you are super-duper honest about everything. For example, don’t say you’re close to transport when you have to walk 10km to find the nearest train station or bus. Naturally, this is going to reflect poorly in your reviews. Another thing is, while it’s tempting to take cash from your guests, for instance if they want to stay an extra night or they want to include another guest, you’ll be leaving yourself vulnerable. While Airbnb do take a small cut, you are protected by them to up to $1 million, in case anything untoward happens. There is also the added security of knowing that Airbnb has run checks on your guests before they enter your home. One other thing you might want to consider is, looking into extra cover for the rare case of theft or intentional damage to your property. There may be an option to update your home and contents insurance to include a renter’s policy. Some insurance companies may even have something specifically for Airbnb. Call them up and ask. Now Airbnb will try to convince you that by having the automatic bookings feature on, will make you more attractive to guests and therefore will bring you in more money. To be honest, it’s a real pain in the buttocks. One, you don’t get to vet who is coming to stay, and two, you have to make sure your calendar is up to date. For instance, if you forget to block off time in your calendar for your cousin’s wedding and somebody books in, Airbnb will penalize you when you go to cancel that booking. They don’t take money from you, but it may spoil your chances of becoming a Superhost, which gives your profile more visibility. Honestly, I have had so much success by switching this feature off. It really is no biggie for someone to send you a quick message asking you if they can stay. It also helps you get a clear idea of the person and why they are travelling to your area. I also changed my minimum night stay requirements to three nights. I was finding that by allowing for the one-night stay, I was missing out on longer bookings and I was forever washing bed linen. I mentioned this previously, but I think it’s worth saying again – “adopt a business mindset” and be professional. This doesn’t mean that you have to be constantly “on” in your own home. In fact, some guests may not want you engaging with them all the time and may give off the vibe that they want their own space. A Superhost is good at reading people and this is definitely a skill that can be learned. Adopting a business mindset simply means having a presentable space that someone would like to stay in and making it your business to ensure your guest feels safe and comfortable. You could also look at offering discounts on longer bookings, or extras such as free milk and coffee or breakfast after the first night, to make your profile more attractive. You could even offer free walking tours around the neighbourhood. If you are not sure on what to charge per night, you can turn on the Smart Pricing feature. This allows you to set your prices to automatically go up or down based on changes in demand for listings like yours. These are controlled by settings that you can adjust at any time. Another thing is to take advantage of Airbnb’s generous referral program. Let this money bank up and you can put this towards your own travel or anything for that matter. For instance, when you sign up to Airbnb you get your own unique referral links that you can use to encourage people to use Airbnb as guests or become hosts. You get paid around $30 if you refer a traveller who books into a place worth $75 or more, and its $75 if you refer someone who becomes a host and takes their first booking. Once you become a Superhost, this amount increases. Anyhow – I sincerely hope this article was useful to you and if you were thinking of becoming a host, this has inspired you to do so. I can’t stress enough how Airbnb hosting has changed my life in a positive way. As mentioned previously, my world is so much bigger. I am connected to some of the most interesting, loveliest people from all corners of the earth. Now that I am financially secure, the money I make through Airbnb is helping me save up for an around the world trip, which I’m excited to share more about in future posts. So, if you are ready to host, I am here to help you. I am offering to help 25 people get set up and ready to start hosting and on their way to becoming a Superhost. A 1hr Coaching Session over Skype or FaceTime: In this session we will set up your profile so that you are ready to take your first booking. While I can’t take your pictures for you, I can give you advice on how to take good ones. So are you ready to jump in? Click here to get started. Once you have signed up for your account, let me know. I will then be in contact to help you finish setting up your profile and get you ready to host your first guest. Have you heard of Kintsugi?! It’s the Japanese art of repairing broken pottery with gold or silver lacquer. The principle behind this method is that the piece is more beautiful for having been broken. Being a recovering perfectionist, this resonated deeply with me. It dawned on me that while we often strive for this false idea of “perfection”, we forget that it is our flaws and our past suffering that makes us who we are. We are shards of clay, held together by a shimmering golden light. We are beautiful pieces of art. Speaking of shimmering lights, I would love to introduce to one of my dear students – Lauren. She has overcome a great deal to be back singing again, after taking a 7-year break from music altogether. She is taking massive strides in gaining her confidence back and is dreaming big about a career as a singer songwriter. 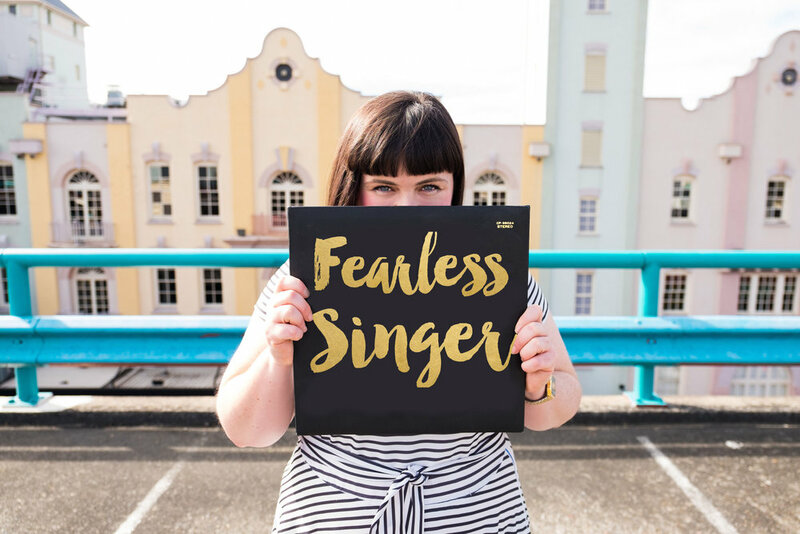 This is a part of a new a Fearless TV series - 'Singer Stories'. Once you’ve had a chance to watch it, we would love to hear from you! Feel free to share your thoughts in the comment below. If you think this would inspire a family member or friend, please feel free to share it with them.